This Chicago-lensed sci-fi/satire may be an immense mess, yet there's something strangely compelling about its scattershot, nonsensical agenda. 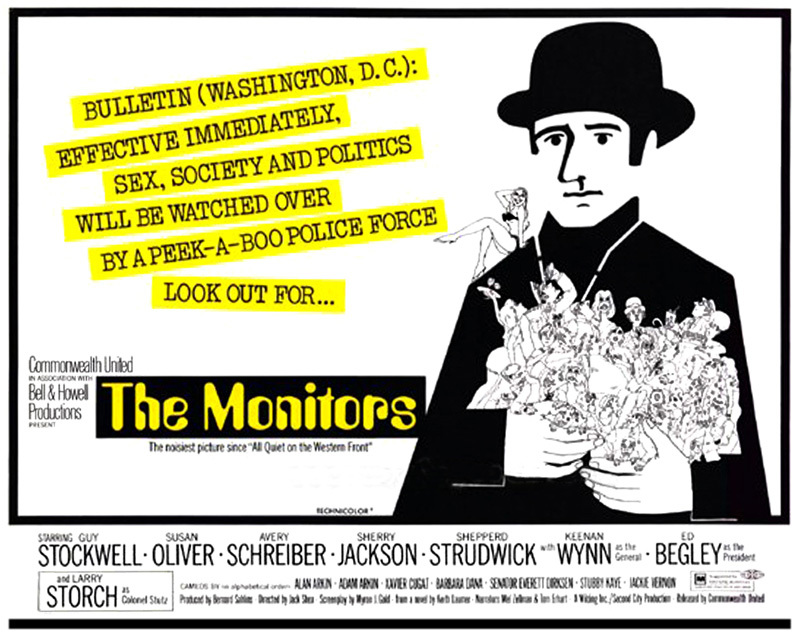 Based (loosely) on a 1966 novel by Keith Laumer, this obviously wants to be subversive and cutting-edge, but director Jack Shea (who cut his teeth helming Bob Hope TV-specials, before moving onto series like THE JEFFERSONS, THE ROPERS and SILVER SPOONS) is in way over his head, with any potentially intriguing concepts buried under a disjointed script and grating comic schtick... We learn at the outset that mankind has been taken over by a bunch of emotionless yet seemingly-benevolent, bowler-hat-wearing, black-turtleneck-garbed alien-missionaries who call themselves The Monitors. Oddly, most of the population accepts their presence, since they've made the planet a nicer, more tranquil place to live -- eliminating war, disease and pollution -- even though it means trading away free will and love, with the media inundated with droning messages of acceptance. And whenever some human gets out of line, arrogant Monitors-leader Tersh Jeterax (Shepperd Strudwick) rounds them up for "counseling." Guy Stockwell (SANTA SANGRE) stars as heroic Navy test pilot Harry Jordan, Susan Oliver (from such offbeat features as THE LOVE-INS, CHANGE OF MIND and YOUR CHEATIN' HEART, and previously worked with Stockwell on a 1961 episode of the TV-series ADVENTURES IN PARADISE) is renowned movie star Barbara Cole, and both soon wind up on the run from The Monitors for disobedience. 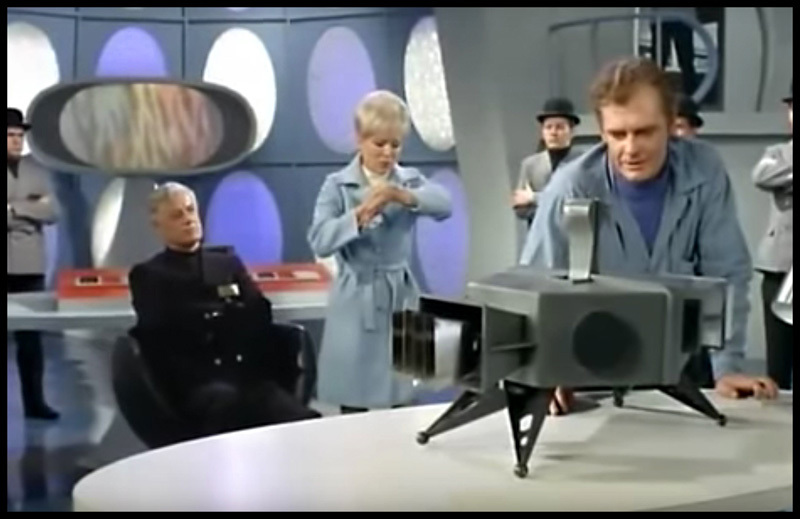 Continually undermining this sci-fi scenario with their mugging, we also have F-TROOP's Larry Storch as the head of an alien-hating underground organization, Avery Schreiber as Stockwell's anarchic brother Max, Keenan Wynn as a war-mongering general, and Ed Begley Sr. as the now-obsolete US President (hence his cobweb-covered desk). Let's not forget lovely, former child actress Sherry Jackson (who blossomed from the eldest daughter on MAKE ROOM FOR DADDY to eye candy guest-spots on STAR TREK, BATMAN and LOST IN SPACE) as a ditzy Monitor-trainee... 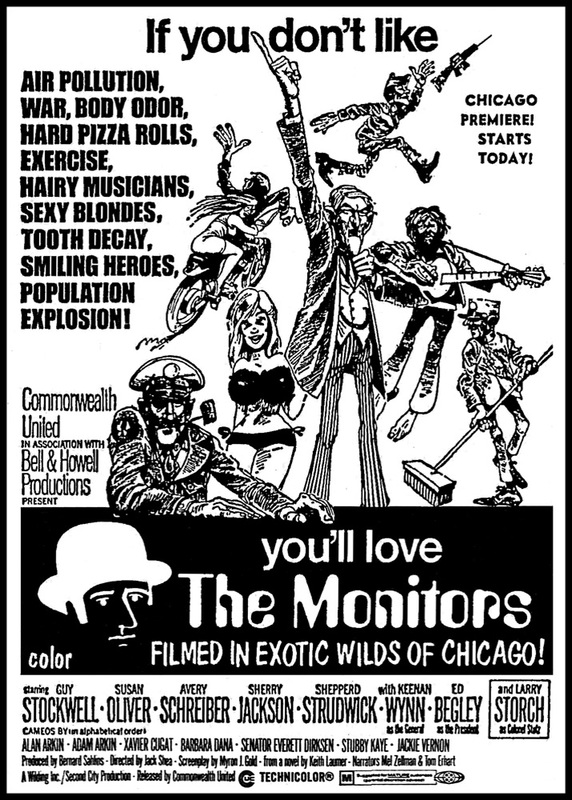 Produced by Second City co-founder Bernie Sahlins, the film is also littered with past and current members of the Chicago improv troupe -- Peter Boyle, Lynne Lipton, J.J. Barry, Murphy "Duck" Dunne, Burt Heyman, Sid Grossfeld, Martin Harvey Friedberg -- plus numerous cameos during periodic TV-commercials promoting The Monitors' good work on Earth, including Jackie Vernon, Xavier Kugat, Stubby Kaye, Republican Senator Everett Dirksen (who passed away before the film was released), as well as Alan Arkin, his young son Adam and wife Barbara Dana. Unfortunately, all of the comedy falls flat (unless the idea of seeing Larry Storch in drag sounds like a real gut-buster to you) and its more self-important jabs about our screwed-up modern civilization are clumsily handled. The one element which succeeds beautifully is its inventive, often-dizzying cinematography by "William" (Vilmos) Zsigmond, while the filmmakers cram everything possible into their chaotic goulash -- colorful psychedelia, chilly Chicago backdrops, mod extraterrestrial production design, slapdash action, and even a dreadful end credits tune sung by Odetta entitled "Voice of the Flower." Buried somewhere under all of its nonsense is a solid sci-fi conceit, with emotionless (but well-intentioned) invaders bringing peace and prosperity. But at what price?...In this instance, the price is an earnest, spectacularly wrongheaded effort which falls flat on its face early on and never really recovers.